We've finally figured it out: An age-appropriate, and definitely rad, way to disguise our coloring-book addiction as something much more mature. A Kate Moss coloring book, of course. The iconic model — with a colorful history — gets all washed out in the Colour Me Good Kate Moss Coloring Book. Just as it sounds, the stunner takes center stage in this 14-page book in outlined illustrations, ready to be brought to life with a little help from Crayola. Excuse us for being tardy for the party — we'll admit the Kate Moss-inspired pastime may not be brand new to the scene — but thanks to a little Pinterest action that caught our eye, we've finally tuned in and are officially calling it the perfect Hump Day treat to push us through the rest of the week. Following in the lines of other fashion coloring books, this Books with Style publication comes with all the exciting imagery and none of the luxury price tags. Don't think of it as child's play (warning: not all the pictures are PG-rated), think of it as a way to spark a little creativity, think outside the box, and draw outside the lines...at least, that's what we'll tell our friends when they catch us scribbling away. 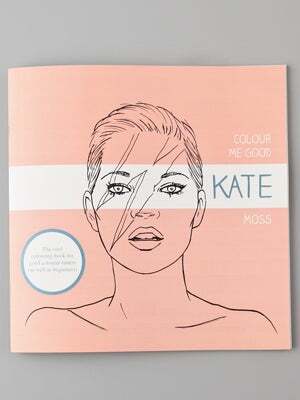 Books with Style Colour Me Good Kate Moss Coloring Book, $15, available at Shopbop.